When it comes vibrant immigrant communities in Michigan, the first thing that comes to mind are the diverse immigrant communities of Southeast Michigan. However, the west side of the state has its own dynamic immigrant community. Grand Rapids is home to such things ArtPrize, Meijer Gardens, Founders Brewing Co., and thousands of immigrants. On May 1st, International Worker’s Day, around 1,000 immigrants and their supporters took to the streets to bring awareness to the current administration’s immigration policies. The march was a multi-purposed event to protest deportations, call for immigration reform in regards to DACA, and to shed light on the economic benefits immigrants bring to their communities. Lately, Immigration and Customs Enforcement (ICE) has been ramping up their detentions and arrests of all undocumented immigrants including those with no criminal record across the United States. Michigan, has been no exception. The state has seen a “117% increase in the number of deportations of undocumented immigrants with no criminal records” from 2016 to 2017. Some of these deportations, such as Jorge Garcia’s, have even received national coverage. Garcia entered the country when he was only nine years old, and after thirty years of residence in the United States, was removed on January 15, 2018, Martin Luther King Jr. Day. Activists in the march pled for an end to the separation of families. “Long-term immigration reform” were on their lips, as many worry for the future of DACA and the Dreamers. The pathway to legal residency and citizenship is one marred with trials and tribulations. To make matters worse, receiving any assistance from the state is near impossible. For example, in a majority of states, including Michigan, undocumented immigrants who are not protected under DACA or who don’t have work authorization are not able to get state-issued identification cards or drivers licenses. While undocumented immigrants wait years upon years to become Legal Residents or Citizens, the country is losing out on an economic boost by not utilizing these workers in the economy. Immigrants are a driving force in Michigan’s economy, making up 8.7% entrepreneurs of the state’s entrepreneurs. Furthermore, Immigrants are almost twice as likely to start a business of their own. From the co-founder of Google, Sergey Brin, to the local restaurateur, immigrants have shaped commerce in this country in general and Michigan in particular. This entrepreneurial spirit should not be snuffed out. A great society cherishes creativity, innovation, and progress. In order to demonstrate the importance of immigrants to the Grand Rapids economy the activists only shopped at immigrant owned businesses. Many did not attend school or go to work during the four day strike. While under this current administration the future for all immigrants (undocumented or not) is uncertain, it is important to stay vigilant. Marches, strikes, and protests spread awareness of the real-life impact poor legislation has on immigrant communities. Non-state actors, such as non-profits and other non-governmental organizations need to work in tandem with activists in their communities. 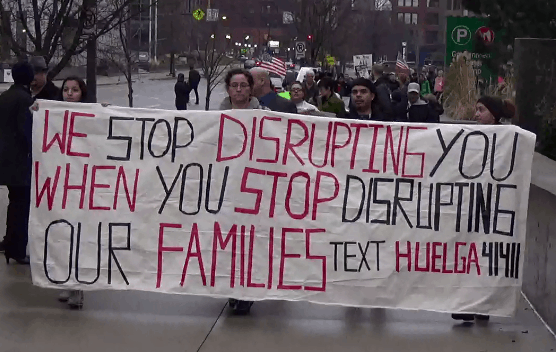 This year’s International Worker’s Day, Grand Rapids stood in solidarity with countless other cities in the country to invest in change and to fight for immigrant rights.